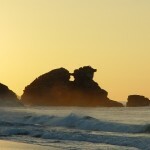 Located 2 miles west of Mazunte and 20 minutes from the Viewpoint development is the small remote seaside village of Playa Ventanilla. To get there take Highway 175 from Viewpoint, turn at the Playa Ventanilla sign and drive 2 miles west towards the beach. 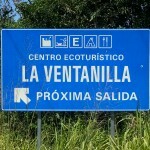 Ventanilla means `little window` and derives from the small opening in the high rocky peak at the east end of the beach. The fine white sand and clear waters extend all the way down to Puerto Escondido. 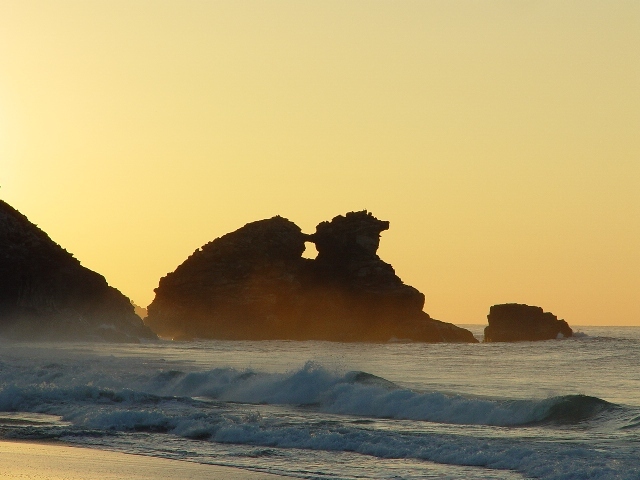 This playa is a great spot for a relaxing day at the beach or to take in the interesting and fun eco-tours offered. Ecotourism at Playa Ventanilla was developed in the 1990’s when the Ecosolar group began work to help the area after then ban on sea turtles and crocodile trade eliminated people’s livelihoods. This group, along with 10 local families began offering tours in the lagoon and beach areas, inviting biologists and biology students to study the area. 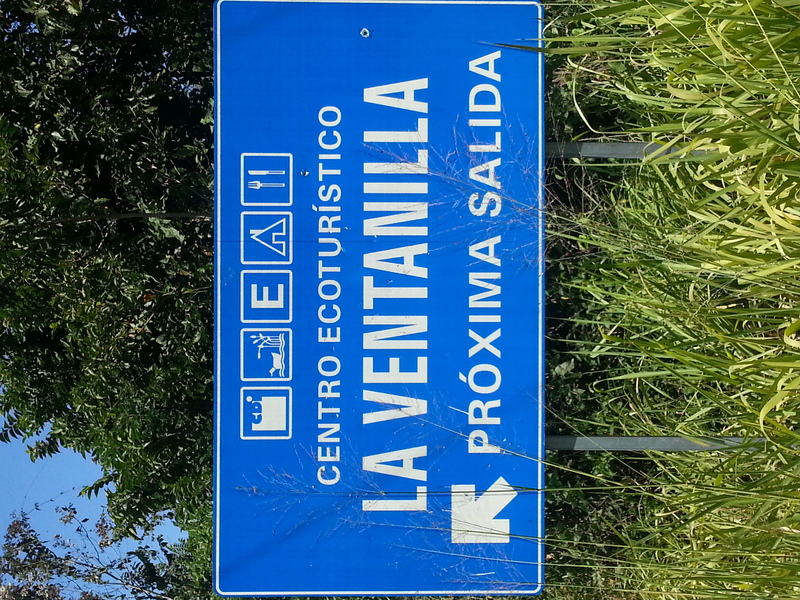 The local cooperative, Servicios Ecoturisticos de La Ventanilla, operates the tours 7 days a week for $4 CDN. They also participate in projects to protect the ecosystem. The money from these tours supports these projects. To take a tour you will go to the circular building to the left of the road as you approach the beach. There is an alternative cooperative that offers 30 minute tours, however this tour does not include the mangrove island (museum, rescued animals, tree nursery) or the conservation projects. The tour is an hour and a half and takes you to an island in the lagoon where cold drinks and food are served. There is also a restaurant in the village with a view of the beach called Restaurant Maiz Azul (Blue Corn). 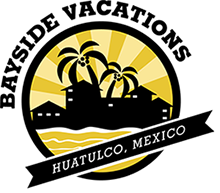 Here they specialize in local recipes, including Oaxaca style tamales, turkey in mole sauce and chiles rellenos. They also sell their own fresh-ground peanut butter. During your lagoon tour you will see crocodiles, birds, iguanas, white tailed deer, pigmy skunk, tropical anteater, raccoon, fresh-water turtles, armadillo, the jaguarundi and possum. Further down the beach is a much bigger lagoon. Locals are willing to guide you there for a small fee. There is also a horseback riding tour of the lagoons. The lagoon is cut off from the sea by the beach much of the year and is full of mangroves as well as a wide variety of wildlife. The two principle mangrove types here are the red mangrove (Rhizophora mangle) and the white mangrove (Laguncularia racemosa). Tannins from the roots of the red mangrove turn the lagoon’s water reddish in the shallows and black in deeper areas. In the mornings, the lagoon fills with the sounds of the many birds that can be found here, including woodpeckers, kingfishers, ducks, storks cormorants, herons and others. During certain times of the year, sea turtles come to lay their eggs on this beautiful beach. Once the eggs are laid and the turtles return to sea, the community volunteers to protect the eggs, gathering them and reburying them in a safe spot. This spot is monitored daily by the volunteers. After about 3 months the baby turtles hatch and are safely released back into the ocean. At sunset during times when the sea turtles lay their eggs, visitors can accompany volunteers as they collect eggs and can participate in the release of baby turtles. They will ask you for a donation to release the turtles by hand. This donation helps support conservation efforts. The local families of Ventanilla help to preserve the turtles by collecting eggs and placing them in a protected area until they hatch. The hatchlings are usually released at sunset. If you ask the tour guides they will tell you when the hatchlings will be released and you can participate in this exciting journey.